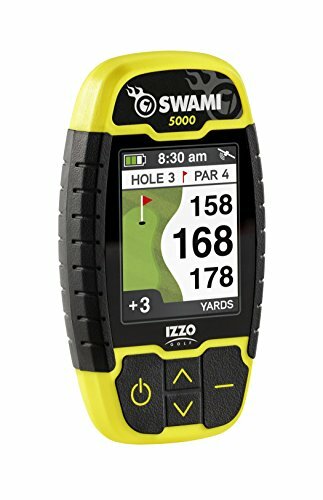 The new Izzo Swami 5000 is one of the fastest, easiest-to-operate handheld Golf GPS devices on the market today. We've added some new features and enhanced many existing features of our best-selling Swami 4000+ without sacrificing the simplistic nature that Swami users love. New features include a slimmer profile with a larger, more vibrant 2-inch color screen, a 12-hour plus (3 rounds) battery life and a scorekeeping function that allows you to store and view multiple rounds on the unit. The Swami 5000 also includes a belt-clip and a new easy-charge magnetic USB charger. Durable and water-resistant, comes with a 1-year limited warranty.